A holiday classic as you’ve never heard it before. Tiny Tim, Bob Cratchit and Ebenezer Scrooge come to marvelous life in Patrick Stewart’s critically-acclaimed solo interpretation of A Christmas Carol. The star of X-Men and The Royal Shakespeare Company, Stewart has performed his one-man stage production of A Christmas Carol to sell-out audiences. Now, in this studio recording of the dazzling achievement that has thrilled audiences in New York and Los Angeles, Stewart invites listeners to rediscover the timeless story at its source: Dickens’ own, classic words, presented in a soaring, virtuoso solo performance in which Stewart plays all parts. I encourage you to review any audiobooks you review on Fridays and include the link here every Friday. If you have reviewed an audiobook earlier in the week, please feel free to link that review as well. Thanks to Pam for creating the button. Thanks to Simon Audio for providing a copy of this book to give away. I seem to fondly recall an animated version of A Christmas Carol featuring Mr. Magoo when I was a kid! I have an UK audio of A Christmas Carol (narrated by HUgh Terry) ready to roll today… We’ll see how it compares! I read A Christmas Carol every few years, but have never listened to it. This could be the year! This is admitting my age – but as a child, we had an LP (remember those?) audio version of A Christmas Carol. I laid on the floor in front of the huge console stereo and listened to it over and over. I re-read the book every year for Christmas. This version sounds wonderful so I’ll be looking for it whether I win or not. Thanks for the chance, though. Patrick Stewart does the best(!) version of A Christmas Carol that I’ve ever heard! He’s such a great narrator! I was really impressed when I listened to the clip! I have A Christmas Carol on my ipod for listening later this month. The edition I have is read by Ralph Cosham. I love Cosham’s reading of Louise Penny’s Three Pines series so that was why I chose his reading of it from the editions available at my library. Maybe next year I’ll listen to the Patrick Steward edition. Good grief? 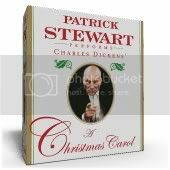 A Patrick Stewart reading of the Christmas Carol? I have to go out immediately and get a copy for my best friend for Christmas. This is the best find ever! I LOVE Patrick Stewart’s voice. I could listen to him read cereal box ingredients, and still be entertained. I’ll bet this is delightful. I have so many audio books that I’m almost finished with. One of these days I’ll be able to participate in Sound Bytes again! Great give away! Love this story and I’m sure it will be awesome with him narrating. As far as my favorite adaptation…hmm. I love the play version I saw at a local theater in high school. So I think I would prefer any in life play as opposed to a movie version. I love the original TV version in black & white…it leaves more to the imagination. Oh my favorite Christmas Carol has always been Mr Magoo’s Christamas Carol…the songs perfect. And the Spirit of Christmas Future scary , but not too scary so young ones can enjoy it. I have always loved the George C Scott adaption best. He made Scrooge…Scroogey! I grew up watching the Scrooge adaptation with Albert Finney. i am so confused after reading all those instructions. I must say I am ver fond of the George C. Scott film version. But actually, I like them all, in different ways. I agree for an audio, I do not think you could beat Stewart. Don’t be confused! None are mandatory, so only do what you want. One of the local theaters in Atlanta has an annual production of A Christmas Carol, and it is wonderful! Awesome giveaway! I love audiobooks, but they are so hard to find in CD form without being insanely expensive. I don’t actually have a favorite. There’s the one from the 80s I really like, the Muppets version, the 3D one from a couple of years ago. They’re all good. I also enjoy Patrick Stewart’s narration at the beginning of A Nightmare Before Christmas. But my favorite adaptation is Bill Murry’s Scrooged. I love Carol Kane.